Make a list of your main possessions to be moved. Get rid of unwanted possessions. Sell what you can at the local car boot sale, in the local newspaper or online. Donate what you cannot sell to local charity shops. When moving for work or business, discuss any possible contributions to your moving costs with your employer. 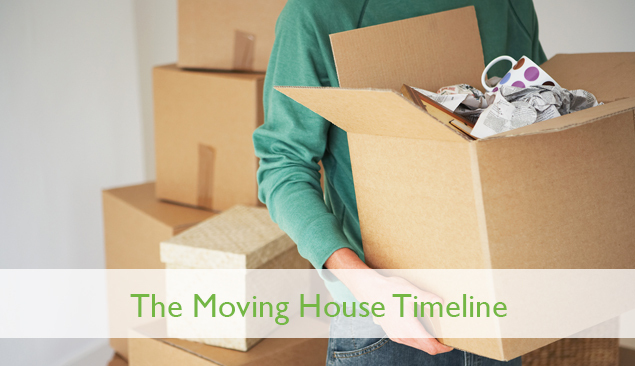 Fix a firm date for moving. Choose your removal company and schedule a removal date. Check for any additional costs you may incur if you are moving at the weekend, on a bank holiday or during peak summer months. Make inquiries about cleaning, storage or handyman services, as your removal company may be able to arrange preferential rates for you. If you take medication, make sure you have enough to get you through the moving period. Dispose of flammable substances, as most removal companies are unable to transport them. Book any cleaning or handyman services in order to be sure they are available for the dates you need them. Gather all important documentation together in a folder so paperwork will be easily accessible when you need it. Finalise packing as soon as possible as this will reduce stress levels. Refer to your checklist one last time. Store clean bed linen in a labelled box which will travel with you. This will ensure it is readily at hand when you need it, after you have unloaded and the beds are ready to be made up. Check arrangements are in place for the collection of the keys to your new home. Take meter readings for all utilities e.g. gas, electricity and water. Stay at hand until all items have been loaded into the removal van. Make a final check by walking through your old home one last time, checking that all items have been removed and nothing has been left behind. Check traffic reports for your journey ahead, if necessary. Make sure all windows are closed and utilities are turned off before closing door for the last time. Following this checklist should help to make your move as straightforward as possible, if you need any help with booking, then visit our Price Checker. Good luck and we hope you will be very happy in your new home.